Technical analysis has a set of tools called momentum indicators or oscillators. These indicators measure price change. The indicators are very useful in deciphering the strength of a price trend. At the same time, these are lead indicators unlike a moving average which is lag indicator. And so, these indicators are highly useful in giving early sign of trend reversals. These are drawn as separate line chart, usually below the price chart to maintain same time scale. RSI is one of the most popular momentum indicator. RSI stands for Relative Strength Index. It is a momentum oscillator used to identify trend reversal. RSI was invented by Welles Wilder Jr. The default look-back period for RSI is 14. However, this can be lowered to increase sensitivity or raised to decrease sensitivity. RSI calculates strength of stock trend and helps to predict their reversals. RSI value oscillates between 0 and 100 and it is called ‘Limiting Oscillator’. 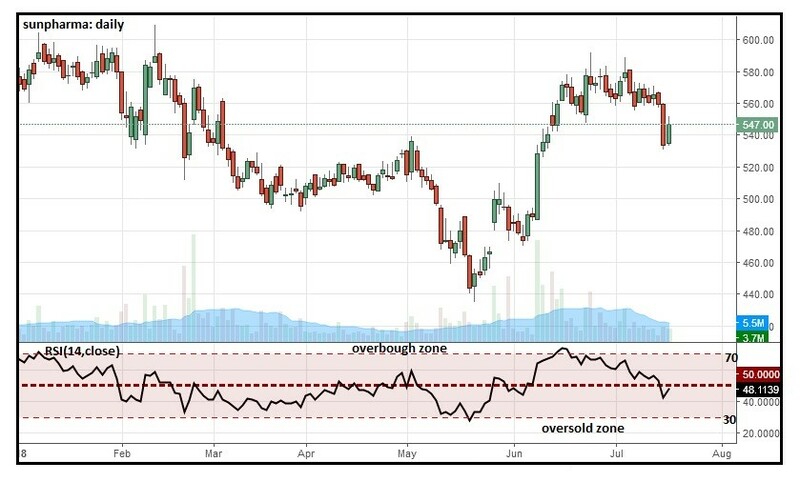 As per Wilder, when RSI value is above 70, it is considered as overbought and when RSI below 30, it is considered as oversold. Some traders use 75/25 or even 80/20 to define overbought and oversold levels. We have shown overbought and oversold levels & plotting of RSI indicator on Price Chart of Sun Pharma. RSI can be used for identifying overbought stocks, helps to cover profits. 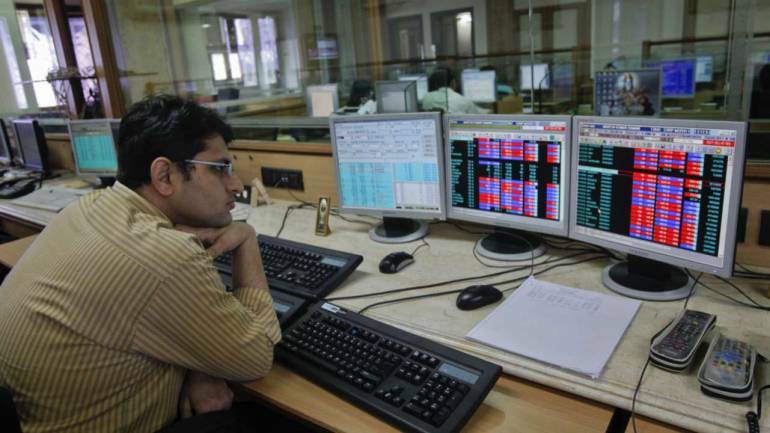 RSI can indicate oversold stocks which are potential reversal stocks too. 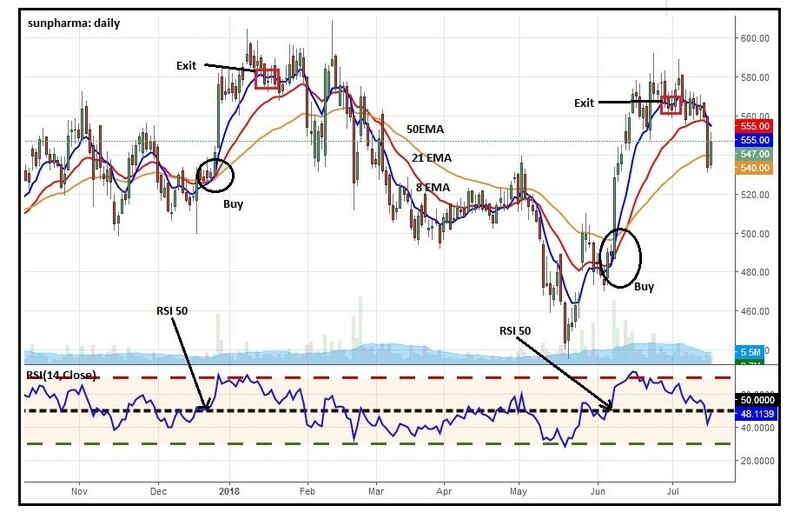 RSI is the most popular tool used to identify direction of the trend, above 50 is considered as Uptrend and below 50 is considered as Downtrend. According to Wilder, divergences signal a potential reversal point because directional momentum does not confirm price. In a downtrend, RSI is making higher high and higher lows while price is making lower high and lower lows, termed as ‘Positive Divergence’. 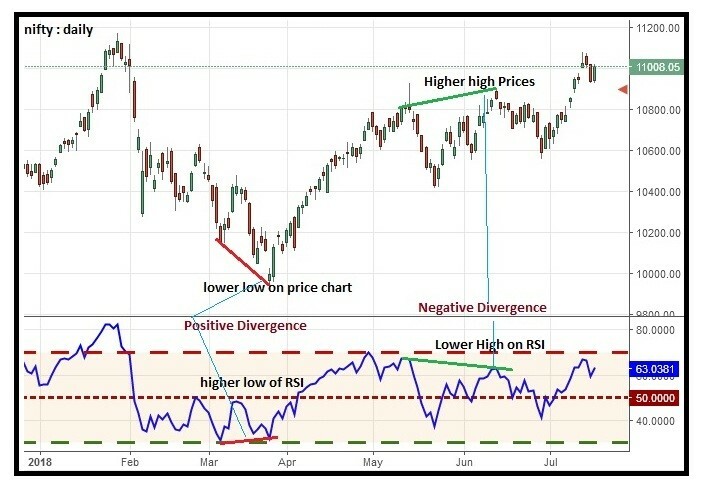 However, in a upward trend RSI is making lower high and lower lows while price is making higher high and higher lows, called as ‘Negative Divergence’. Nevertheless divergence loses its significance in sideways market. 1) When the RSI breaches the centre line from below it is a stronger signal that a trend change has happened than a simple extreme reading above or below the 70-30 lines. In this case it is a obvious signal to go long in stock. 2) When the indicator crosses the centre line from above, it means that the average losses are exceeding the average gains over the period and it signals to fresh short selling or profit booking in long. 3) When a centre line cross happens, it can be a good time to think about trade entry on a fresh pullback in price also. There are a lot of trading strategies used with RSI, below mentioned is one of the most popular among trading community. When RSI moves above 50 with combination of another indicator like rise in volume and Moving average crossover of EMA (8) & EMA (21) and prices are trading above EMA (50). Whenever price candle is closed below EMA (8) or bearish crossover of EMA(8) & EMA(21). Stop Loss:- Low of Previous candle, i.e. one candle prior to ‘Buy Signal candle’. Below example indicates Buy signal in SunPharma on daily chart. When RSI moves below 50 with combination of moving average crossover of EMA (8) & EMA(21) and prices are trading below EMA(5). Whenever Price Candle closes above EMA (8) or bullish crossover of EMA(8) & EMA(21). High of Previous candle. i.e. one candle prior to ‘Sell Signal candle’. • RSI also often forms chart patterns that may not show on the underlying price chart, such as double tops and bottoms and trend lines. • In an uptrend or bull market, the RSI tends to remain in the 40 to 90 range with the 40-50 zones acting as support. During a downtrend or bear market the RSI tends to stay between the 10 to 60 ranges with the 50-60 zones acting as resistance. This range is also called as RSI Channel. • The RSI is often used in conjunction with trend lines, as trend line support or resistance often coincides with support or resistance levels in the RSI reading.